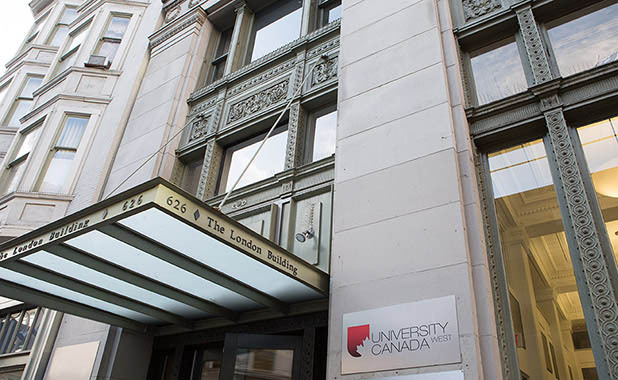 In 2014, University Canada West (UCW) relocated to the historic the London Building at 626 West Pender Street and currently occupies the first five floors and has recently taken over the 6th floor. 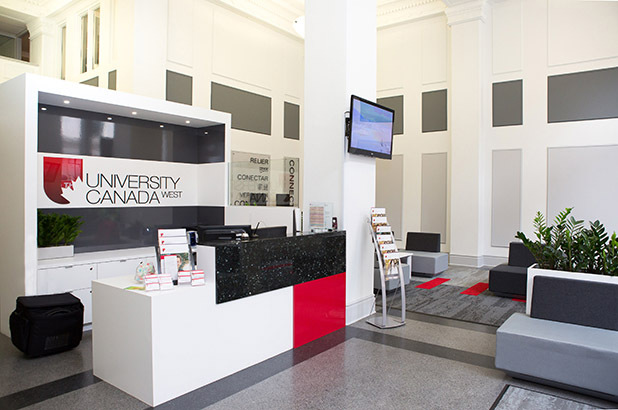 Since this relocation, the University has completed a major reconfiguration of the lobby, significant improvements to the first and second floors, and a full renovation of the fourth floor, offering additional amenities and added space for students, faculty and staff to enjoy. Renovations are currently underway on the third floor, which will expand the number of classrooms and add additional student amenities. Constructed in 1912 as part of Vancouver’s pre-Great War building boom, The London Building is a heritage office building and many of the building’s interior and exterior features have heritage protection. The London Building photographed in 1927. The Edwardian Commercial building was built for the London and British North American Company and was designed by the architectural firm Somervell & Putnam, which also designed other prominent commercial buildings around Vancouver. The London Building’s design features include an embellished cornice, decorative coursing and medallions at the upper levels, and a richly-ornamented iron storefront at street level. The building is clad in Haddington Island stone and includes marble trim. The quarry started operating in 1896 and is located not far from Vancouver Island’s Port McNeill. Other prominent buildings with stone from the same quarry include Vancouver City Hall, the B.C. Legislature in Victoria and the Hotel Vancouver. The original banking hall on the main floor is massive and includes double-height proportions. The understated detail in the moulded plasterwork of the coffered ceilings and floral ornament to the column capitals reinforce the grandeur. The original open stairwell remains intact and runs the full height of the building. It includes gray-green Missisquoi marble wainscot from Quebec, with curved end panels, marble treads, cast iron risers, balusters and newel posts. 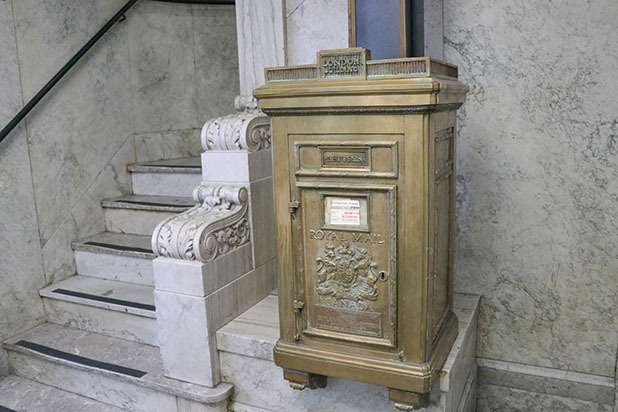 A Cutler Mailing System mailbox for Royal Mail Canada still sits on the first floor. 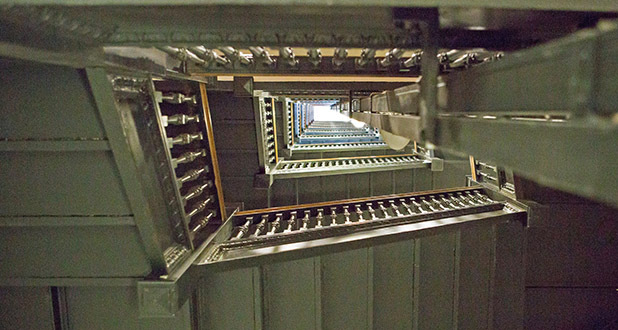 A mail chute runs the length of the stairwell. Letters could be dropped from any floor in the building for easy collection by the mailman. Ornamental cast metal surrounds at each elevator station including the basement stations and the original vault still remains in the UCW library. The 105-year-old heritage building provides students with an inspiring environment for learning.